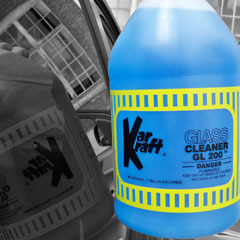 A high-solvent, non-ammonia, ready-to-use glass cleaner. Ideal for quick removal of tobacco smoke stains, traffic film and bugs. Pleasant fragrance. Avoid contact with painted surfaces.